PLEASE NOTE: THE PATTERN ON EACH OF THESE DIAPERS WILL VARY A BIT. 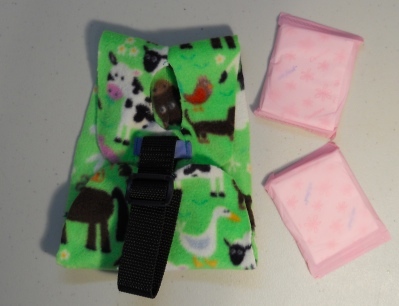 WHERE YOU SEE A COW OR A GOOSE MAY BE IN ANOTHER SITE ON THE HOLDER PER DIAPER. 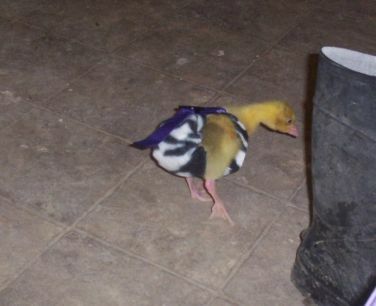 This one is for a Gosling that is past the hatchling size and a bit larger, it will fit your gosling for a few weeks. It is very adjustable. Our Embden, the fastest growing of the goose breeds wore this size at 3 weeks. This one is made with BARN YARD PRINT (that will vary per diaper holder) Polar Fleece and oh so cute. They grow so fasssssst! If it arrives and it would be a bit too big, wait a day or two (literally) and try it on your baby goose again. The Goose Diaper Holder comes to you with two Pantie Liners to get you started. This Diaper Holder will fit most geese breeds from a week or so old and for a few weeks, they grow so quickly. I would highly recommend that you purchase at least two Goose Diaper Holders for change out. Not only will you want to wash the diaper holder out now and again, they are goslings and at some point may very well get a bit of poop on the holder it's self. (but again, you can wash the holder out by hand and return it to the goose after ringing it out). ALL THE MONEY YOU SPEND WITH US GOES TO CARE FOR OUR ANIMALS HERE IN NW SD. WE APPRECIATE YOUR BUSINESS! Thanks for looking.